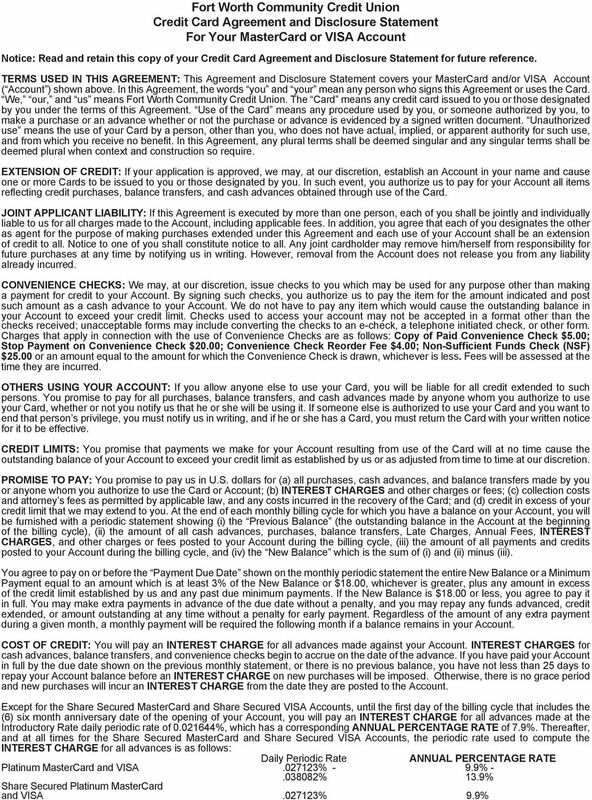 Download "Fort Worth Community Credit Union Credit Card Agreement and Disclosure Statement For Your MasterCard or VISA Account"
2 The INTEREST CHARGE is figured by applying the periodic rate to the Balance Subject to INTEREST CHARGE which is the Average Daily Balance of your Account, including current transactions. The Average Daily Balance is arrived at by taking the beginning balance of your Account each day, adding in any new cash advances (including balance transfers), and unless you pay your Account in full by the Payment Due Date shown on the previous monthly statement or there is no previous balance, adding in new purchases, and subtracting any payments or credits and unpaid INTEREST CHARGE. This gives us the daily balance. The daily balances for the billing cycle are then added together and divided by the number of days in the billing cycle. The result is the Average Daily Balance. The INTEREST CHARGE is determined by multiplying the Average Daily Balance by the number of days in the billing cycle and applying the periodic rate to the product. 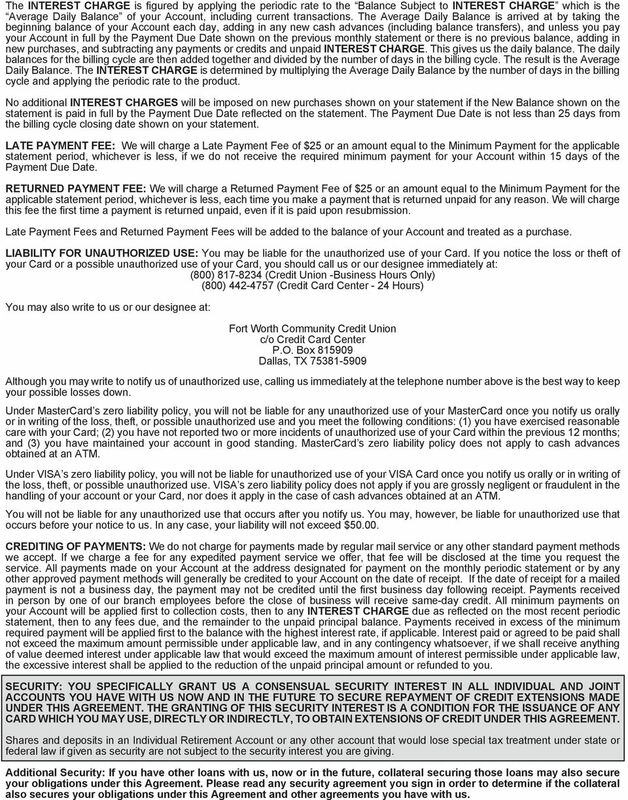 No additional INTEREST CHARGES will be imposed on new purchases shown on your statement if the New Balance shown on the statement is paid in full by the Payment Due Date reflected on the statement. The Payment Due Date is not less than 25 days from the billing cycle closing date shown on your statement. LATE PAYMENT FEE: We will charge a Late Payment Fee of $25 or an amount equal to the Minimum Payment for the applicable statement period, whichever is less, if we do not receive the required minimum payment for your Account within 15 days of the Payment Due Date. RETURNED PAYMENT FEE: We will charge a Returned Payment Fee of $25 or an amount equal to the Minimum Payment for the applicable statement period, whichever is less, each time you make a payment that is returned unpaid for any reason. We will charge this fee the first time a payment is returned unpaid, even if it is paid upon resubmission. Late Payment Fees and Returned Payment Fees will be added to the balance of your Account and treated as a purchase. 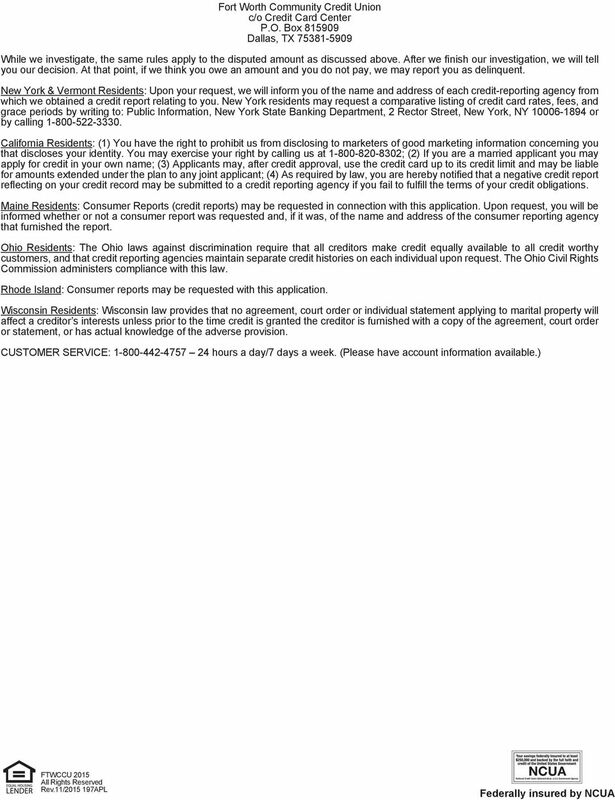 LIABILITY FOR UNAUTHORIZED USE: You may be liable for the unauthorized use of your Card. 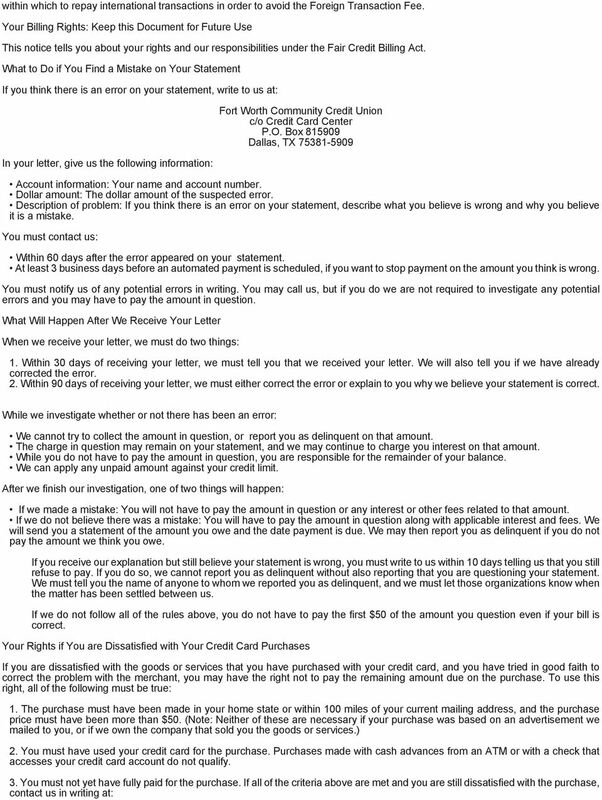 If you notice the loss or theft of your Card or a possible unauthorized use of your Card, you should call us or our designee immediately at: (800) (Credit Union -Business Hours Only) (800) (Credit Card Center - 24 Hours) You may also write to us or our designee at: Fort Worth Community Credit Union Although you may write to notify us of unauthorized use, calling us immediately at the telephone number above is the best way to keep your possible losses down. Under MasterCard s zero liability policy, you will not be liable for any unauthorized use of your MasterCard once you notify us orally or in writing of the loss, theft, or possible unauthorized use and you meet the following conditions: (1) you have exercised reasonable care with your Card; (2) you have not reported two or more incidents of unauthorized use of your Card within the previous 12 months; and (3) you have maintained your account in good standing. MasterCard s zero liability policy does not apply to cash advances obtained at an ATM. 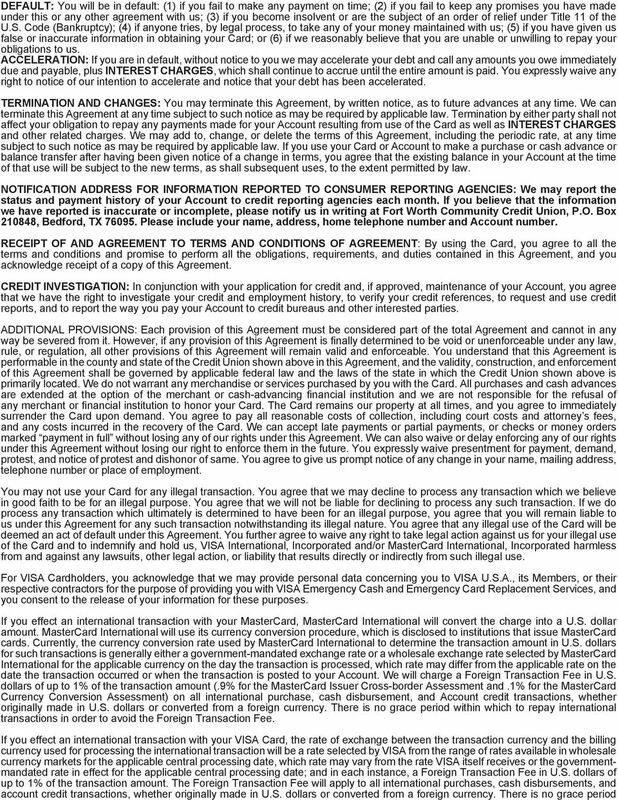 Under VISA s zero liability policy, you will not be liable for unauthorized use of your VISA Card once you notify us orally or in writing of the loss, theft, or possible unauthorized use. VISA s zero liability policy does not apply if you are grossly negligent or fraudulent in the handling of your account or your Card, nor does it apply in the case of cash advances obtained at an ATM. You will not be liable for any unauthorized use that occurs after you notify us. You may, however, be liable for unauthorized use that occurs before your notice to us. In any case, your liability will not exceed $ Crediting of Payments: We do not charge for payments made by regular mail service or any other standard payment methods we accept. If we charge a fee for any expedited payment service we offer, that fee will be disclosed at the time you request the service. All payments made on your Account at the address designated for payment on the monthly periodic statement or by any other approved payment methods will generally be credited to your Account on the date of receipt. If the date of receipt for a mailed payment is not a business day, the payment may not be credited until the first business day following receipt. Payments received in person by one of our branch employees before the close of business will receive same-day credit. All minimum payments on your Account will be applied first to collection costs, then to any INTEREST CHARGE due as reflected on the most recent periodic statement, then to any fees due, and the remainder to the unpaid principal balance. Payments received in excess of the minimum required payment will be applied first to the balance with the highest interest rate, if applicable. Interest paid or agreed to be paid shall not exceed the maximum amount permissible under applicable law, and in any contingency whatsoever, if we shall receive anything of value deemed interest under applicable law that would exceed the maximum amount of interest permissible under applicable law, the excessive interest shall be applied to the reduction of the unpaid principal amount or refunded to you. SECURITY: YOU SPECIFICALLY GRANT US A CONSENSUAL SECURITY INTEREST IN ALL INDIVIDUAL AND JOINT ACCOUNTS YOU HAVE WITH US NOW AND IN THE FUTURE TO SECURE REPAYMENT OF CREDIT EXTENSIONS MADE UNDER THIS AGREEMENT. THE GRANTING OF THIS SECURITY INTEREST IS A CONDITION FOR THE ISSUANCE OF ANY CARD WHICH YOU MAY USE, DIRECTLY OR INDIRECTLY, TO OBTAIN EXTENSIONS OF CREDIT UNDER THIS AGREEMENT. Shares and deposits in an Individual Retirement Account or any other account that would lose special tax treatment under state or federal law if given as security are not subject to the security interest you are giving. Additional Security: If you have other loans with us, now or in the future, collateral securing those loans may also secure your obligations under this Agreement. Please read any security agreement you sign in order to determine if the collateral also secures your obligations under this Agreement and other agreements you have with us.